Rikert Nordic Ski School – Opening the doors to Winter in Vermont – at your pace. Whether you are looking to learn a new skill, feel more confident and comfortable on your skis, or perfecting your technique, our experienced PSIA* certified staff is ready to help you achieve that goal. 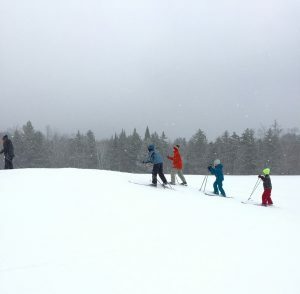 We offer Classic (diagonal stride) and Skate Skiing technique lessons to all ages, from the novice to experienced skier, looking to learn and improve. We teach Private, Semi-Private (2 people), and Group (3+ people) lessons, with or without rentals and offer Kids Programs, and Elementary School Programs. Group Lessons meet daily at: 10:30am and 1:30pm. Semi-Private and Private Lessons meet by appointment. 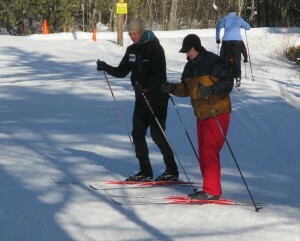 Please give the Nordic Center a call (802-443-2744) to book a lesson time. Includes Trail Pass, Classic / Skate Ski Rentals and One hour of instruction. Each lesson includes: Equipment, Trail Pass and One hour of instruction. Classic or skate sessions to refresh & improve your skiing skills with a certified PSIA instructor. Beginner Lessons: Geared to the person who has never skied before, or has spent very little time skiing. Intermediate, Advanced and Specialty Lessons: Are geared to working on more specific techniques. Why sign up for Nordic Ski Instruction? Is it for me? Learning correct technique and gaining a better understanding of the fundamentals will greatly increase your enjoyment of the sport. A good foundation and basic skills will allow you to feel confident in your ability to ski most anywhere. It is easy to develop some bad habits and inefficient technique. An instructor can set you on the right path and have you coming back for more. You’ll learn to expend less energy and enjoy that effortless feeling of Nordic skiing (well, maybe it will take more than one lesson…) Learning good technique from the beginning means not having to spend time unlearning ingrained bad habits and poor technique.